For Atlanta offices in need of new workstations with cutting-edge designs or used models that look like new, Panel Systems Unlimited is the systems furniture company that offers an extensive selection and unbeatable value. 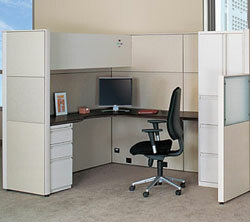 When you purchaseused cubicles, refurbished workstations, and other furnishings from Panel Systems Unlimited, you can rest assured that your purchases will look like new. This is because our used models are carefully inspected and retouched by office furniture craftsmen with more than 40 years of combined experience. Whether you buy them new or slightly used, our furnishings come from some of the most reputable names in the industry. No matter what brand you choose, our systems office furniture experts can help you procure the right number and style of workstations to perfectly complement your Atlanta office. We can create detailed CAD drawings of your unique workplace andinstall your new computer workstations to better optimize the functionality and workflow of your office. As your full-service panel system solutions provider, we can also obtain Office Star chairs, file cabinets, and other casegoods to match yourmodular furniture selections. Contact Panel Systems Unlimited today to learn more about our new and used workstations, refurbished office furniture, modular office furniture, and parts and accessories for your office in Atlanta, Charlotte, Birmingham, Nashville, Jacksonville, and all across the Southeast.